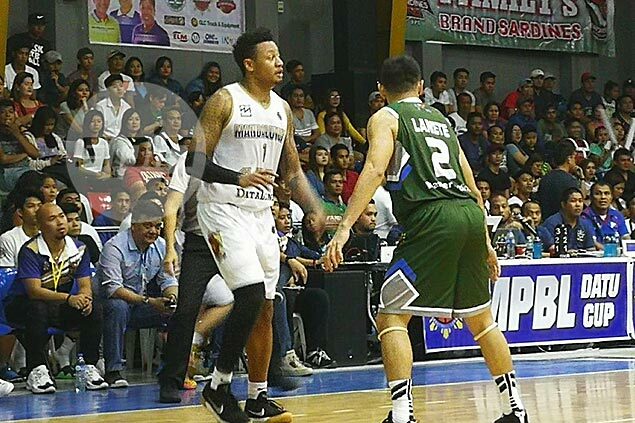 IMUS — Prince Rivero scored 18 points while Bobby Ray Parks had 13 points and a league-record 15 assists as Mandaluyong atoned for an opening loss by beating Zamboanga, 71-61, on Saturday night in the Maharlika Pilipinas Basketball League (MPBL) Datu Cup. The El Tigre notched their first-ever franchise win thanks to Rivero’s timely explosion and a record-setting night at the Imus Sports Complex.for Parks, who surpassed the previous record of 14 assists set by Paolo Hubalde of the Valenzuela Classic in the Rajah Cup. Mandaluyong improved to 1-1 and made up for a loss to Muntinlupa on opening day last June 12. The El Tigre led by as many as 16 points, 40-24, but saw the gap dwindle to three points, 48-45, before Rivero scored seven straight points to restore order. The Valientes cut the deficit to five points in the fourth quarter, but Rivero and Parks hit baskets to bring the lead back to 69-59 for the El Tigre. After a 30-point MPBL debut, Reed Juntilla had 16 points for the Valientes while Rudy Onde added 14 points. Mandaluyong 71 – Rivero 18, Parks 13, Boholano 9, Abrigo 8, Lozada 8, Bonsubre 6, Torres 3, Cauilan 2, Javillonar 2, Alabanza 2, Cunanan 0, Andaya 0, Vidal 0. Zamboanga 61 – Juntilla 16, Onde 14, Orera 9, Javier 7, Lanete 6, Berame 5, Miraflores 2, Lacastesantos 2, Guiyab 0, Parreno 0, Ferrer 0, Esa Das 0, Rublico 0. Quarters: 23-10, 40-26, 57-47, 71-61.